So here I go again, trying to make another version of deviled eggs, hoping and praying that it turns out somewhat decently since we are having a few couples over tonight for an Easter potluck! 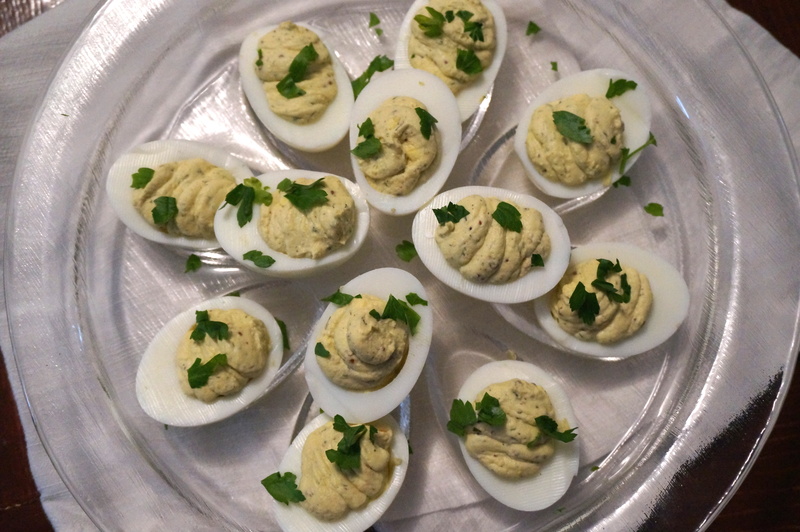 This time around I decided to make “not-so-devilish” deviled eggs (shall I call them “angelic eggs”?) because not only am I making these for everyone else, but because I also want to enjoy a few! The recipe I chose/invented actually uses 1/3 less fat cream cheese and plain greek yogurt instead of the traditional mayo. I added a good amount of Dijon and some spicy brown mustard, dried dill weed, parsley, salt and pepper, a pinch of crushed red pepper flakes, and a dash of hot sauce. I apologize for not including exact amounts in the recipe below… that’s because I don’t actually know how much I added! That’s the best part of deviled eggs- you really can just eye everything you add! 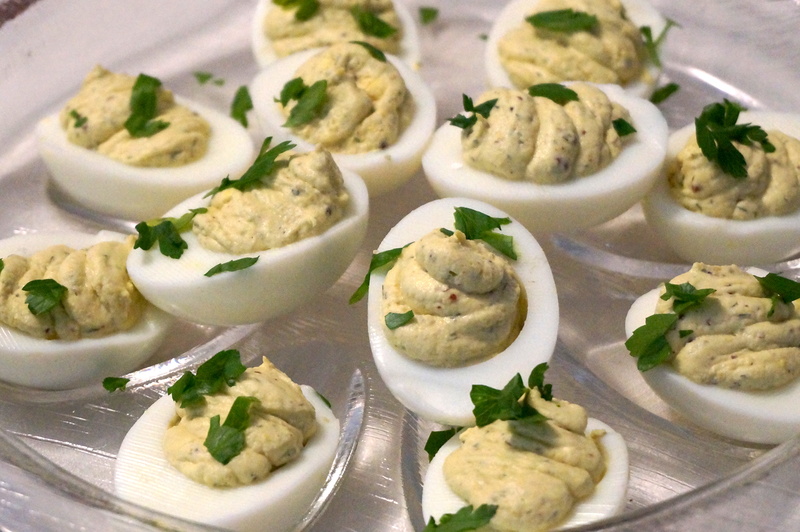 A “healthified” version of your classic deviled eggs recipe, perfect for Easter! Place raw eggs into a large saucepan and fill the pan with enough cold water to cover eggs. Bring water to a boil and turn off heat. Allow eggs to sit in hot water for 12 minutes. Peel each egg and slice in half. Squeeze out yolks and separate into a separate bowl. Add cream cheese and mash with a fork until smooth. Add yogurt and remaining ingredients and stir until combined. Spoon filling into a quart-size ziplock bag. Snip one small corner off of one of the bottom edges with a pair of scissors. Fill the hollowed-out egg halves with the egg mixture by squeezing gently in circular motions around the edge of the well, working towards the center. Garnish with freshly minced parsley! Slow Cooker Pork Paninis, Two Ways!